At the edge of Idarwald mountain range lies the village of Schauren with its half-timbered houses, which are so typical of the Hunsrück region and well worth seeing. The Baroque church built in 1767, and one of the most beautiful in Hunsrück, is a special attraction here. It is a hall church, typical of the villages in Hunsrück, with a three-sided, semicircular apse at the end of the chancel, a ridge turret across the western gable, and an entry porch with turned pillars and wooden pilasters. Particularly notable is the onion-shaped porch roof, which is covered with native slate and which allows something of the richness of form from the Baroque period to shine through. In the interior of the church the highly coloured painted heavens on wood, so typical of Late Baroque style, reflect not only folk art, but also a deeply felt sense of piety of these ordinary inhabitants of Hunsrück who had such a meagre lifestyle. In the gallery, where many pictures are artfully arranged, is a valuable Stumm organ from 1780. Johann Michael Stumm (1683-1747) was an organ builder who was famous far beyond his immediate area in Hunsrück (Sulzbach am Idarwald) and was esteemed for his work. He established a dynasty of organ builders, which produced more than 200 beautifully crafted and superior sounding instruments. Another highly recommended excursion is to the nearby town of Stipshausen where another Hunsrück treasure is to be found: a village church, which also has an elaborate gallery and a beautiful Stumm organ. A richly rewarding hike leads from Schauren past the nearby village of Kempfeld to Wildenburg on the top of Wildenburg mountain (675m). There a massive observation tower, which was erected by the Hunsrück Society (association for the advancement of cultural heritage), offers you a magnificent view over the entire Idarwald range with Idarkopf mountain at the eastern end of the massif. 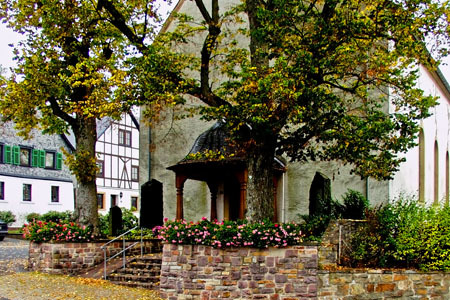 An "historic learning trail" leads you around Wildenburg mountain. On this circular path through history you will first encounter the remains of a large Celtic settlement with a castle from the Latène Age (500-20 B.C.). After the Roman conquest of the area during the Gallic war, a Roman mountain temple stood here for almost 300 years. The next historical stage you come across is a Late Roman fortification, which was constructed around the year 350 A.D. to defend against raids by the Germanic tribes. And finally, on the uppermost heights of the mountain ridge, are the ruins of the medieval fortress Wildenburg, which was defended by moats deeply hewn into the rock. This castle was built in 1328 by the Wildgraf (a nobleman with the status of Earl) Friedrich von Kyrburg, with his administrative seat at Kyrburg Castle in Kirn on the Nahe River. Today at the foot of the castle hill a rustic-style restaurant sits on the medieval foundation wall of the lower castle. For additional information: Eduard Finke, Kirchenbau in neun Jahrhunderten; In: Kunst und Kultur im Birkenfelder Land, Universitätsdruckerei und Verlag Dr. Hanns Krach, Mainz 1982, p. 49-80.